Shred Connect along with many other shredding companies in the area offer multiple document destruction options. The approach you personally take to paper shredding services will depend solely on your secure document shredding needs. At Shred Connect offer two approaches that our customers like and appreciate; our unique drop-off sites and our mobile shredding house calls. Shred Connect’s drop sites are located strategically throughout multiple communities in Orange County, including Newport Beach. All you need to do to use our drop off location shredding services is bring in your old or outdated materials in to the location nearest to you and leave them in a locked secure document shredding container. After the container is full our partners at the paper shredding location give us a call and we come to pick up and destroy all of the documents. We then provide you with a Certificate of Destruction so you can rest assured that your confidential documents will never been seen again. Other shredding companies tack on hidden fees in order to justify the cost of doing business in this day and age. Shred Connect never charges any add-on monies or fuel surcharges—there’s no need to procure additional debt, much less alienate our loyal customer base. Our no-frills approach to our work ensures that any paper shredding done is completed on time, with very little wasted effort. Our employees love what they do and are very good at fulfilling your wants and needs. 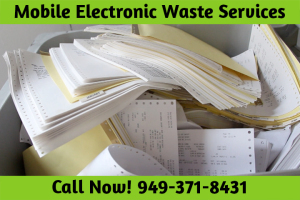 We provide punctual, thorough mobile shredding services and drop off shredding that reflects upon our public perception and induces individuals to continue requesting our paper shredding services instead of seeking out other shredding companies. We do our very best to keep our customers happy and if you have a suggestion as to how our shredding company can do things better please don’t hesitate to give us your feedback. We pride ourselves on being a step above other shredding companies through our superior customer service. Call Shred Connect today and avoid sub-par services with other shredding companies.